If you love super-woody smells that take you to another world, then you’ll love Sandalwood Essential Oil! Derived from the wood of the sandalwood tree in India and Australia, Sandalwood Essential Oil has long been cherished for its soft, creamy and woody scent. This beloved essential oil comes with an assortment of health benefits, and is often used in aromatherapy and skincare applications (especially when paired with a carrier oil). Before we dive in, let’s go over the two most common types of Sandalwood: Indian Sandalwood (Santalum album) and Australian Sandalwood (Santalum spicatum). The Indian variety is a bit more earthy and woody, while the Australian version is often described as soft and sweet. The main difference between the two is that Australian Sandalwood tends to contain less santalol, an ingredient that has health benefits. People have been using Sandalwood for centuries in religious ceremonies and for medicinal applications. 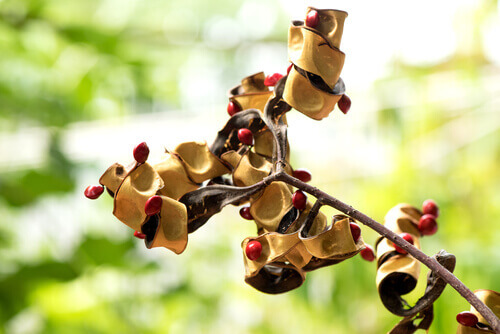 Our ancestors used it to soothe burns, assist with excessive sweating, and calm nerves. Plus, there’s some evidence to suggest that Sandalwood could be incredibly valuable health-wise. Some studies show that it can help increase alertness, dull worry, and support faster wound healing. Meditation Mastery: Because it’s historically been used in religious ceremonies and other applications to clear the mind, Organic Sandalwood is perfect for filling your meditation space with something sweet and soothing. We recommend diffusing to enjoy gentle, sedative effects. Anti-aging Elixirs: Sandalwood is all natural, which makes it very popular for various skin-related applications. When paired with an extra-beneficial carrier oil, it can be used to soothe redness, blemishes, dry skin and fine lines. Calming Candles: Pair the soft, woody smell with other vibrant scents—Ylang Ylang, Lavender, Patchouli, you name it—to create aromatherapy candles to calm you down when you need it the most. Learn how to make your own essential oil candles with all your favorite scents. Natural Health Boosters: Studies show that Sandalwood can have some measurable health benefits, from helping reduce symptoms associated with blood pressure issues, to making you feel more alert. One of the most amazing things about this oil is a compound called a-santalol, which helps promote healthy skin. It’s not a bad idea to toss this oil in your medicine cabinet! Hydrating Hair Oil: When mixed with Argan Carrier Oil or Fractionated Coconut Oil, Sandalwood can work wonders on dry, dull hair. Put a few drops of Sandalwood mixed with your preferred carrier oil in the palm of your hand and massage it into the hair. A little bit goes a long way, so even a small amount is great for extreme dryness. Make it a Mask: Use Sandalwood and a thickening agent ,such as avocado, oatmeal, or honey, to create a paste you can apply to your face as a mask. For topical application to the face, we suggest a 1% dilution (3 drops of Sandalwood to 10 mL, or two teaspoons, of carrier oil). Leave the mask on your skin for 10 to 15 minutes so it can soak up all of the oil’s essential benefits. Major Mood–Lifters: Another great benefit of Sandalwood is that it’s known to perk you up and lift your spirits. Add a few drops of the diluted oil to your aromatherapy locket for an instant pick-me-up or diffuse it at work for an easy mood booster and to support memory. Get More Sleep: When we think of relaxing essential oils, we often think of Lavender and Chamomile. But there are many other oils that can be used for this purpose, too! Sandalwood is ideal for diffusing at bedtime to support a restful night of sleep. Regardless of if you choose Australian or Indian Sandalwood, you’ll enjoy a delightful fragrance and many unique health benefits. Both kinds start as fragrant wood and turn into oil through the process of steam distillation. Add a few drops to a tablespoon of bubble bath and drop it in hot bath water, diffuse it into the air or rub diluted oil directly onto your skin…this high-quality essential oil is amazingly versatile! I’ve been wanting Sandalwood for awhile now and this blog post is very convincing. It sounds like I would like the Indian variety better as I don’t always tolerate sweet oils, but I’m not sure I can bring myself to spend that much on one oil, either 5 mL or 2.5 mL. Plus, I read a review that the 2.5 mL has about 20 drops in it, is that correct? Oh decisions! This reminds me that somewhere I have a sandalwood comb. Now I want to make a hair blend with sandalwood. Sandalwood is one of my favorites. Just ordered a bottle. We appreciate the 15% off or any sales & blog ideas you offer. Australian sandalwood is my absolute favorite single ever! I haven’t tried Indian, will be looking into this version! Wondering if anyone can compare the scents for me? I blend sandalwood and patchouli together and use it as my anti anxiety blend. I think it’s time for a new bottle. my aromatherapist said i can use this to for the broken capillaries on my face. any idea fr PT? I can’t wait to try this on my hair! Thank you for the blog post, I just splurged on the Organic Australian Sandalwood and I can’t wait for it to arrive!! 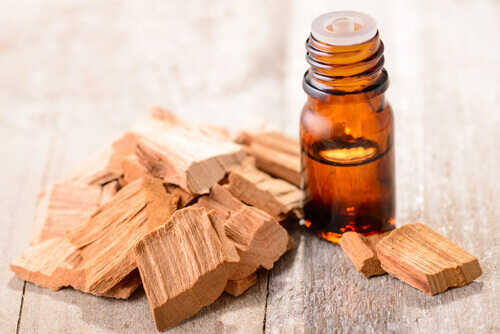 I always seem to gravitate toward products with sandalwood, a sure sign that this scent is powerful, and I am so excited to have a bottle of essential oil to play with in my home made products. My husband eczema is currently flaring and I think the sandalwood diluted in sweet almond oil is going to work wonders on it. Sandalwood is totally on my wish list ! I hear so many great things about this oil and it seems to be in SO many of the blend recipes that I come across. I will be saving points to get this treasure !! This post has convinced me that I need to purchase sandalwood! I’ve been on the fence for months, but all of these ideas sound so amazing! It is amazing! You’ll love it! Love all of this! I can’t wait to try Sandalwood!! Gosh, now I want to get both of them! Great Ideas! Sandlewood is one of my son’s favorites, but I seldom used it myself. I’ve started using it on my hair and see such a difference! It is like a miracle for sore/scratchy throat! Smells amazing too! Absolutely! One of my favorite things to use it for! Thank you for the clarification on this oil! I keep seeing it in recipes and I wasn’t sure exactly what it was. Always looking for more scents to diffuse at night so we don’t get tired of Lavender. Sandalwood really is a lovely oil Laura and one of my must haves! I hope you enjoy it. You won’t regret it Janine! It is one of my all time favorites and certainly a must have. Sandalwood is one of my favorites! I like to diffuse it at night to help me relax, but I also like it diluted in carrier oil and applied as a lightly scented perfume. Sandalwood Australian is one of my favorites, and I use it sparingly so I can keep it for longer. Glad to learn more uses for it. Makes me want to save up for Indian, too. I was planning on getting Australian, but now I’m not sure. Oooh, the pain of having to choose! This is oil I hope to get this July sales! I can’t wait to try some of these suggestions!! I love PT Blog!! I’ve read about this amazing oil at a few different websites now, I’m originally from Australia so I think I know what type I should buy…I hope to add this oil to my growing collection soon! They’re both amazing oils! You will not be disappointed! Saving up for these two yummy oils. Thanks for explaining the difference between the two. I’m always looking for new mood lifting and meditation oils to diffuse when I’m feeling out of sorts or stressed! Loved this post on some different uses and simple recipes for Sandalwood. I have never used it on my hair, so looking forward to trying it. Oh wow! Now I definitely need to get some sandalwood! Would love to try it on my hair! I love that you provide us with different ideas on how to use our oils! Love PT!! We love you guys, too! Glad this was helpful for you! Sandalwood (album) has been my favorite for many years. I used to use a hair oil I made with jojoba, Sandalwood, and Frankincense (cart.). I need to dig that recipe out and try it with argan, too! Adding this to my night serum ASAP! I got the set with blue tansy, sandalwood and helichrysum and these are already my favorite oils! Let us know how it works out for you!! Thank you for this! I need Sandalwood for only one recipe but was hoping (since its pretty costly) that i could find other uses before I order! Ask and you shall receive! It’s a great oil to have for relaxation. Thank you for this spotlight on Sandalwood. I have it but don’t use it often. Lately I’ve been thinking I need new blends for sleep, so I can see that Sandalwood will be a go-to! I love the smell of sandalwood and vanilla! Great ideas. Most of my oils are to help with sleep and relaxation but I haven’t had the budget to get Sandalwood yet. I think after reading this article I might have to! This one has been on my wish list for awhile. Hoping to get it soon! Thanks for explaining the difference between the two types! I’ve been meaning toto look that up. Thank you for all the great ideas for my sandalwood. I have mainly been using it topically for sore throats and diffused for sleep. I am excited to try it as a mask. Few drops of sandalwood and ylang ylang mixed with jojoba in my 10ml roller ball, rub it on my neck, ears, chest…..one of my favorite oils is sandalwood. I do try to make it last and only use as needed but…..I just love all my PT oils. Now that sounds simply heavenly CT! Sandalwood is a favorite of mine too. I like the mask idea. I’m guessing that the thickening agent would not be counted as a carrier, correct? I really adore sandalwood for my hair. I’ve been using it diluted in jojoba with a drop or two of neroli to add a little something extra for the scent. After my shower, I like to shake a few drops into my hand and brush it through before spritzing with the rose hydrosol. I’ve got some pretty damaged hair from heat styling, and I think using this has helped make a difference in improving the condition. Sandalwood is great for so many things, and it smells great, too. Glad to hear you’re experiencing results! I made Princess perfume with Neroli, Yuzu and Sandalwood. I’ve been wanting sandalwood, love all the ideas above. I am now trying to find organic soy because those candles are so pretty and I bet the scent is divine! This is definitely on my wish list! I especially want to try the Australian one. Sandalwood Australian is my favorite. It’s great with Vetiver and Cedarwood. Australian Sandalwood has been my favorite for years. Do not forget about sustainability though! Oh Sandalwood is already on my wishlist, but after reading this article I don’t know if I can wait any longer to try it. Thanks so much for the great information! Glad this was helpful for you. Sandalwood is one of my favorites! My husband has a sandalwood aftershave that he loves. I’m going to save up for this so I can make it for him! You won’t regret it, it’s amazing! How can it perk you up and put you to sleep? I am wondering if there are any concerns about depletion of the Indian version. Thanks for asking Lorraine! Plant Therapy works very closely with our farmers to ensure that we have sustainable practices in place. When it comes to Sandalwood our harvesters follow strict regulations relating to the size and quantity of trees harvested and maintain a comprehensive replanting program aimed at preserving the species. For more information please feel free to email us at [email protected]. Have a great day! 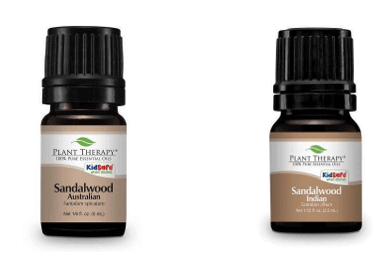 I have both the Australian and Indian sandalwood from Plant Therapy and they are both amazing. I love putting a couple of drops of each in a roller bottle. So happy to see this. I need something to help with my dry hair! I love Sandlewood!! So many uses for it! This is a lot of good info and I will be putting it on my wishlist! Sandalwood is one of my favorites. I think you’ll love it! Thank you for writing this post. I’ve struggled for uses for my sandalwood. Looking forward to using this fabulous oil more often. We are so glad you have learned more ways to use your amazing sandalwood! You’re so very welcome! If you need any other ideas feel free to send us an email at [email protected]. Have a great day! Great question Sharon! I’m happy to say that Plant Therapy works very closely with our farmers to ensure that we have sustainable practices in place. When it comes to Sandalwood our harvesters follow strict regulations relating to the size and quantity of trees harvested and maintain a comprehensive replanting program aimed at preserving the species. For more information please feel free to email us at [email protected]. Have a great day! I adore Sandlewood! It is my calm, but also a splurge oil for me. I couldn’t agree with you more Amanda! Sandalwood is definitely a must have for me too. Thank you for showing some uses for this wonderful oil. I have Australian and am happy to now know some great ways to use it. I love sandalwood! It’s so calming and blends well with so many other oils. How would sandalwood be used for burns? What dilution rate? Sandalwood is my favorite oil! It’s worth the splurge! I was finally able to get Sandalwood Australian and it smells amazing! Wonderful aroma that’s not too overpowering. Love the smell of sandalwood, very rich! Sounds like 1 for the wish list. This has been on my wishlist for a while! I love sandalwood candles so knowing that there can be another purpose besides the amazing smell is so cool! Just added to my wishlist to help with sleep. That’s one of my main reasons to use essential oils and how I started on my oily journey. Thank you for this great information about Sandalwood! I have been wanting to purchase this oil, but I’ve been holding out since it’s a bit pricier than many of the other oils. I think I’m ready now! Thank you! You won’t regret it! It’s truly an amazing oil! Great ideas! I can’t wait to try sandalwood and argan oil on my dry hair! I hope you love this combination!